Fabrizio was the best!Friendly, helpful, patient, humorous,knowledgeable, resourceful on a very busy day. The Capri Excursion was outstanding. Excellent lunch as well. Excellent tour! Guide was wonderful and we got to see and do so much. As we were on a cruise we were very grateful we managed to get earlier ferry tickets back to save rushing to get back onboard. Can thoroughly recommend. This is a good tour. However, the tour company failed to realize another cruise ship had completely booked the 10:00 AM ferry to Capri, so we had to wait until 11:00AM cutting off an hour of our tour. We had been met at our ship at 8:30 so it was a very long wait. They should have pre-booked the tickets for our tour group, not wait until that morning to get the tickets. The young tour guide was not that into conducting this tour. He did an adequate job but no more. 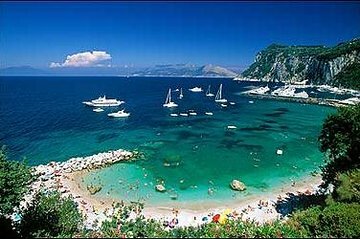 Arriving later than expected on Capri caused themt o have to adjust the tour. Because we had no leeway in our return time, the other older guide took us back to the port right after lunch and suggested we take a boat tour around the island, which we did paid extra on our own that was excellent. The older guide got us return tickets for the ferry and told us to make sure we were at the boat by 4:15. When we looked at the tickets after he left us, we realized there were for a later time. We panicked at first and stood in line at the ferry ticket booth to try to change them -to no avail. So having no choice or any contact for the local guides we just went with the tickets to the earlier ferry. Fortunately they let us on the boat but it was stressful none the less. Fantastic tour with local guide. This was exactly the same tour offered by our Holland America cruise but for much less. The tour unfortunately left one hour later than the ship's and consequently made our return one hour later than theirs. Luckily, we just made it back in time because when the ship says be back by their sailing time, they mean exactly that!! Because we had grown up listening to our parent's Gracie Fields records, we had always wanted to see where she spent the latter part of her life. The time to get to Capri from Naples was one hour each way which I hadn't realized. It is a very beautiful island for the wealthy as everything is so expensive. The included lunch was poor and the can of Pepsi cost 4 Euros.........ridiculous!! Still, glad we did it. Thanks Viator. Handicapped by people on the tour who were late. The information on where to meet was not on the voucher. We had to find someone at the port to help us. The guide was late to pick us up and his time keeping on the tour was terrible. We took an earlier ferry back from Capri as we did not trust the guide to get us back before the ship sailed. Our tour was to start at 8:45 and we did not catch the ferry until 9:30. Although Capri was super crowded, it was an okay experience. The Blue Grotto was closed due to waves and the lines were too long to do anything else. The lunch was okay, but not great.